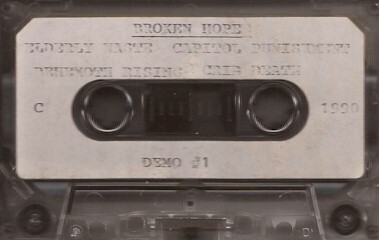 The core of Broken Hope formed in 1988 by Joe Ptacek (vocals), Jeremy Wagner (rhythm guitar), Brian Griffin (lead guitar), and Ryan Stanek (drums) scored a deal with the then-fledging Grindcore/RedLight Label and cut their debut album, Swamped in Gore. Printed four panel covers. Studio tapes with stickers on the shell. Lyrics and band picture included.